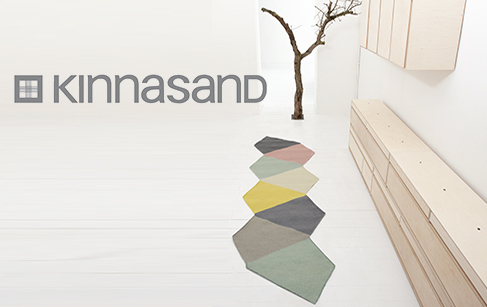 Originally from Kinna in southern Sweden, Kinnasand produces subtle yet clear Nordic designs for contemporary homes. In doing so, the company draws on over 200 years’ experience of producing unique, high-quality textiles and carpets. Their visionary products are characterised by individuality and attention to detail. Made from the very best materials, they are crafted by the world’s finest weavers using state-of-the-art technologies. The Kinnasand design team understands that design goes beyond the mere surface of an object, and is instead an overall creative process that culminates in cutting-edge products. Their experience in selecting and processing materials, combined with state-of-the-art technologies, are a premise for the high-quality character of their products. In close, personal dialogue with local manufacturers, the Kinnasand team develops innovative, unexpected solutions. First-class textiles appeal to our senses. That is why Kinnasand do not make any compromises when it comes to good quality. In-depth knowledge, attention to detail, premium quality raw materials and the most capable production partners across Europe make a tangible difference for their brand.